Another virtually flawless CD-ROM from Voyager Company, First Person: Stephen Jay Gould - on Evolution was the first release in Voyager's short-lived "First Person" series of CD-ROMs that showcase some of the most brilliant and influential thinkers of our world today. This CD-ROM features Dr. Stephen Jay Gould, a prolific evolution biologist at Harvard who has written hundreds of insightful essays on evolution, and who is arguably the best "popularizer" of natural science today. In addition to including the fully indexed, searchable text of his best-selling book "Bully for Brontosaurus," the CD-ROM features an original 60-minute video lecture by Dr. Gould on Darwin's discoveries. The lectures are extensively annotated and cross-referenced to the included essays on the CD-ROM, and Dr. Gould is as lively and accessible on video as he is in real life. He has a real talent in explaining sometimes hard-to-grasp concepts in layman terms, without ever resorting to "dumbing down" his subjects. 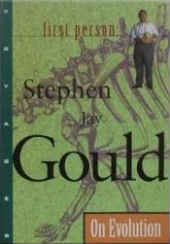 Whether or not you have an interest in evolution history, First Person: Stephen Jay Gould is a must-have CD-ROM that will broaden your perspective and knowledge about one of the most important scientific discoveries in history. Highly recommended.